Kangaroos and wallabies are macropods. Wallaroos, quokkas, pademelons, potoroos, rat-kangaroos, honey possums, and tree kangaroos are also macropods. There are more than 50 species of these marsupials and they vary in size. The smallest are small enough to hold in your hands and weigh around half a kilogram (just over one pound). 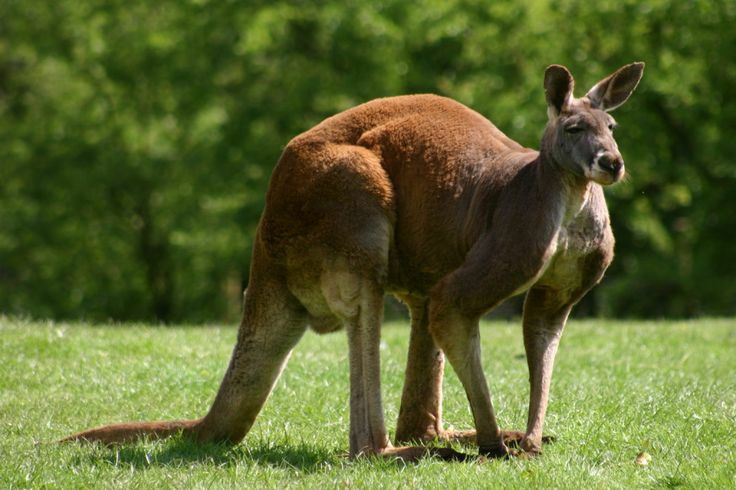 The six largest macropods are called kangaroos. The biggest species of kangaroo is the red kangaroo. Red kangaroos can grow close to two metres tall (over 6 feet) and weigh around ninety kilograms (close to 200 pounds). Size is the MAIN difference between Kangaroos and wallabies. Kangaroos and wallabies both communicate by thumping their feet on the ground loudly, grunting, growling and with other noises as well as through various behaviours. Above is a photo of a Red Kangaroo Joey. Do you see how long it's shins are compared to the rest of it's body? Above is a photo of a Swamp Wallaby Joey. Do you see how short it's shins are compared to the rest of it's body? Besides size, leg length is another difference between kangaroos and wallabies. As you can see, kangaroos have longer shins compared to their body than wallabies do. Above is a photo of a Grey Kangaroo with a Joey in her pouch. Above is a photo of a Swamp Wallaby with a Joey in her pouch. You might notice again the difference in shin length between the kangaroo and the wallaby in the photos above. Where I live we see species of both kangaroos and wallabies. The kangaroos usually keep their distance from our house, although, we did have a young kangaroo run straight through it one day! I suspect it was being chased by the swamp wallaby we call Puss Puss. I don’t know if Puss Puss is a normal male wallaby or if he is a bit strange. He is very territorial about the yard space around our house. Have a look at the Little Visitors page if you would like to see some photos of the animals at our place.